Good: Limited release should help make sure long-term value, unique costume card piece, solid image selection given set's limited focus. Bad: No card text, high price accentuated by film's status as a flop. The Bottom Line: Although this is labeled as a preview set, don't expect Rittenhouse to churn out a full-fledged set for the latest take on the Conan legend. That's not Rittenhouse's fault, but rather the fact that the movie wasn't well received. In fact, it tanked. That said, the 2011 Rittenhouse Conan Movie Preview set is a solid way to fill a page in your card binder. Offering both an autograph and costume card from Jason Momoa, the film's star, the main hits are there. 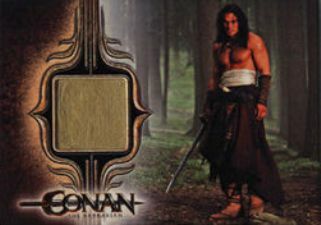 The seven-card base set features full-bleed fronts where the only text is the Conan logo. The photos all center on Conan. Card backs are disappointing. While they have another great photo, there's no text to go with it other than legal fine print. Although I love strong photography on cards, I also like a little background on the subject matter. Here, the base cards boil down to what's essentially Jason Momoa in various states of going shirtless. Both the autograph and costume card have traditional Rittenhouse designs, but that's not a bad thing. Both have clean lines and look elegant, like a lot of the company's cards do. Knowing this is a preview set and not a full-fledged set, you know the checklist isn't going to be big. At just nine total cards, the 2011 Rittenhouse Conan Movie Preview set is small and focused. It's all about Conan. Sorry, Rachel Nichols and Rose McGowen fans. By including both a Momoa autograph and costume card, Rittenhouse did a great job at hitting the most meaningful possibilities for the film. Value largely depends on how much you pay for the set. At full retail, there's little value, even with the Mamoa autograph, costume card and low print run. Simply put, this isn't worth $100. The secondary market has recognized this, sending prices more into the $60 range. This is much more reasonable. While the Momoa autograph is the key, his signature is available in other sets so it's not like it's the only opportunity collectors have to get Conan. As sets dry up and enter personal collections, this set will be tough to find and prices could slowly climb. But given the cool reception of the film, it's going to take longer than many probably hoped. The big factor in how each collector receives the Conan Movie Preview set will depend largely on what they think of the movie. If they're a fan, they'll likely love it. For me, looking at the cards is a reminder of how disappointed I was. Other than the lack of text, it's a solid mini set that covers the main components, achieving a somewhat rare feat of getting a movie lead to sign. 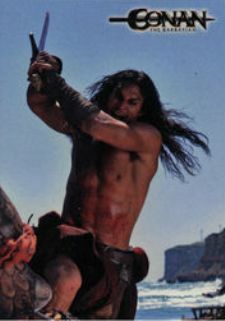 Conan the Barbarian has a long history in comics, films and trading cards. The 2011 Rittenhouse Conan Movie Preview set gives collectors an abbreviated look at the latest film starring Jason Momoa. The nine-card factory set comes with seven Conan character cards, a Momoa autograph and a costume card. The set is limited to 300 copies. 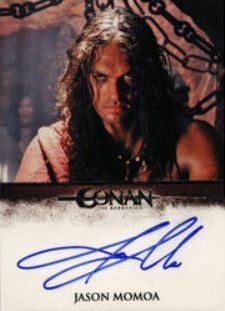 Every set comes with a Jason Momoa (Conan) Autograph and Costume Card with a piece of Conan's bandage. Seven Character Cards mix action shots and portraits of Conan from various points of the film. 250+ Card Lot- 1992 Ken Kelly + 1993 Boris Vallejo 3. Conan. Barbarian. Swords.